A Runza, trademarked by the Runza fast food chain, is also known as bierock or a pirozhki. To make a long description short, it is a bun with a filling baked right in. My mom's pirozhki were smaller and filled with potatoes and cheese; the fast food chain's version are sandwich-sized and stuffed with beef and cabbage. This one's stuffed with seasoned black beans, purple and green cabbage and shredded carrots. The boys loved them, and any trick to get them to eat more veggies and legumes is a good one, right? I'll start this recipe filling-first to be truthful. You see, I was baking bread anyway and simply took a portion of dough out to make our Runzas. Any bread dough will do. 2 cups black beans, pre-cooked or canned and well rinsed. In a lidded saucepan, gently warm the olive oil and onions. Add the beans and seasonings then stir until hot. Stir in the cabbage and carrots and the quarter teaspoon of salt. Put the lid on the pan and turn the heat off. The cabbage will soften as the mixture cools down enough to work with. Take enough bread dough to make about a dozen rolls and divide it into eight portions. (If you don't have bread on the go, a recipe follows.) Roll the dough into balls and allow to rest for ten minutes. Flour your board or counter top. Roll each ball into a round about ten inches in diameter. Flip each dough circle over so it does not stick to the board when you fill it. Place an equal portion of filling onto each dough circle, keeping it on one half. At this point, you can either fold the circle over to make a moon-shaped pocket, or roll it up like a tootsie roll and tuck in the ends. Either way will work as long as you pinch all edges together well to make a seal. Spray a little olive oil onto a cookie sheet. Place the Runzas/bierocks onto the sheet and make small steam vents on the top of each with a knife. Allow the dough to rest for half an hour, then bake for about 18 minutes @365F. Stir the yeast mixture into the flaxseed mixture. Add the whole wheat flour and one cup of the white flour. Mix until the dough forms a ball that pulls away from the sides of the bowl. Use some of the remaining flour to flour your board. Scrape the dough ball onto the floured board and knead for eight minutes, adding a little flour at a time as required. The dough should be satiny and not sticky at all. Pour a little olive oil into the bottom of a bowl. Spin the dough ball around in the oil then flip it oiled-side up in. Cover with a clean cloth and allow to rise until double, about an hour to an hour and a half, depending how warm your kitchen is. Punch the dough down well by gently kneading it for half a minute, to get the air bubbles out. Divide the dough as required for your recipe, and proceed. For Runzas/beirocks, divide into eight and form as described above. For more natural food recipes, check out the Homestead Barn Hop and Make It Yourself Mondays, and Martha Mondays, and the Hearth and Soul Hop, and Fat Tuesday, Tasty Tuesdays, and Real Food Wednesday, Healthy 2Day Wednesdays, Full Plate Thursdays, Simple Lives Thursday, the HomeAcre Hop, and Foodie Friends Friday, weekly link-ups where bloggers share natural recipes and home ideas. What a delicious way for kids to eat their veggies! Your "Runza" look really tasty, and I love all the wholesome ingredients and gentle spicing. Thank you for sharing this recipe with the Hearth and Soul hop. I just love your Bierocks, they look so healthy! Hope you are having a great weekend and thank you so much for sharing with Full Plate Thursday. This looks like a delicious and hearty meal! Thanks for sharing on Foodie Friends Friday! I never heard of these! They look really delicious. Thank you for linking up on Foodie Friends Friday! Please come back this week to join us again! 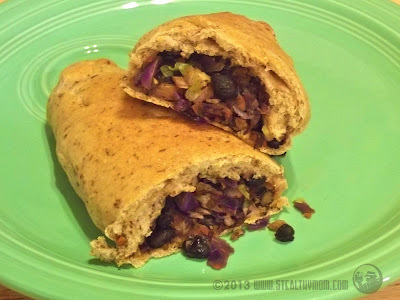 I love the idea of making veggie bierocks! What a brilliant idea!